Fast food isn't usually healthy or environmentally friendly, but a new automated kiosk in Chicago is aiming to change that. 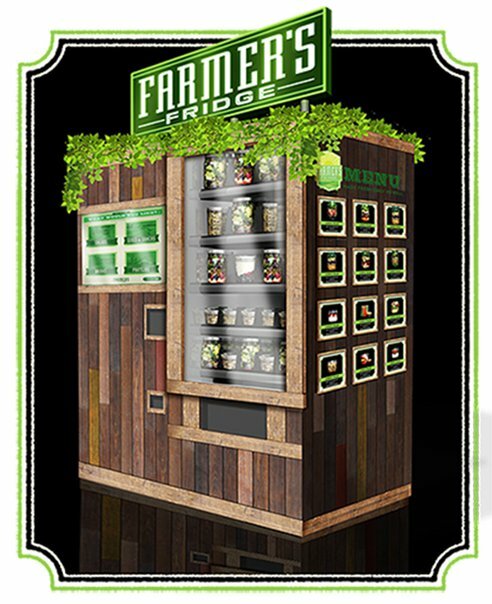 Farmer's Fridge is like a vending machine, only it offers fresh salads, yogurt parfaits and veggie sticks. Farmer's Fridge sources fruits and vegetables locally and organically as much as possible, something of a challenge during the winter in Chicago. The kiosk is stocked with fresh items each morning, and what isn't sold at the end of the day is donated to a soup kitchen. There's even a $1.00 discount on salads sold after 6:00 PM. The produce is appealingly layered in clear plastic containers, which can be recycled with the rest of your number 1 plastics or returned to the kiosk for re-use. Founder Luke Saunders told Modern Farmer he hopes to one day offer an incentive program for recycling. According to their website, the kiosk uses less than $10.00 of electricity per month and is built from reclaimed barn wood. There are currently two Farmer's Fridge locations, one at the Garvey Food Court and one at the Lake Forest Tollway Oasis.